One of the charms about the U.S. 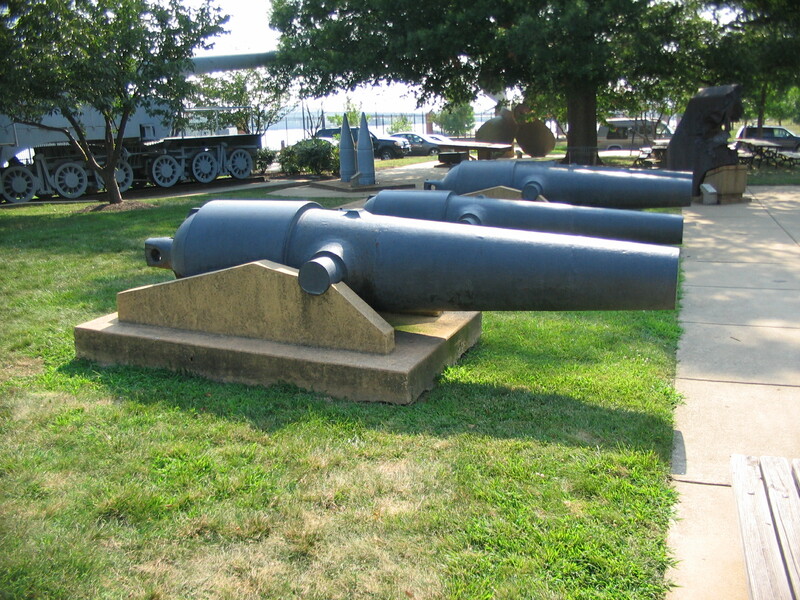 Naval Museum at the Navy Yard in Washington, D.C. are the outdoor cannon exhibits. For field artillery, rarely can a specific piece be tracked back to a “known” history. 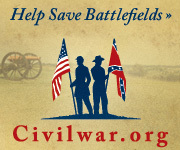 One notable exception is Calef’s gun, firing the first shot at Gettysburg. On the other hand, a large portion of Naval ordnance can often be traced back to a specific ship and occasionally, by way of that fact, to a specific historical incident. The collection at the Navy Yard in Willard Park and Leutze Park include some noteworthy pieces with such histories. Four pieces in Willard Park, sitting between a massive World War I railway gun and a 16-inch battleship gun, trace back to an incident which occurred on June 17, 1863. 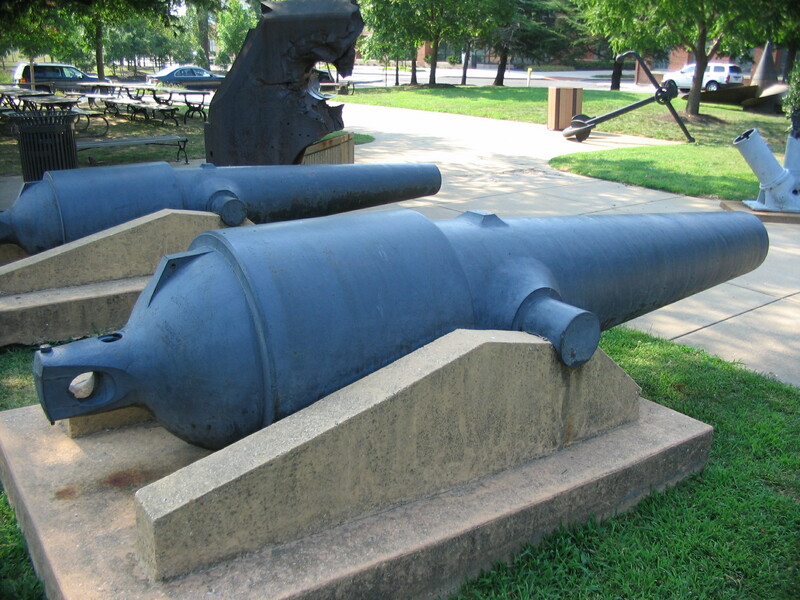 The guns were originally the main armament of the CSS Atlanta captured off the Georgia coast. All are Brooke Rifles cast at Tredegar Iron Works in Richmond. The Confederate ironclad included two 7-inch Single Banded Brooke rifles, mounted fore and aft on pivot. Complementing these were two 6.4 inch Single Banded Brookes, on broadside mounts. 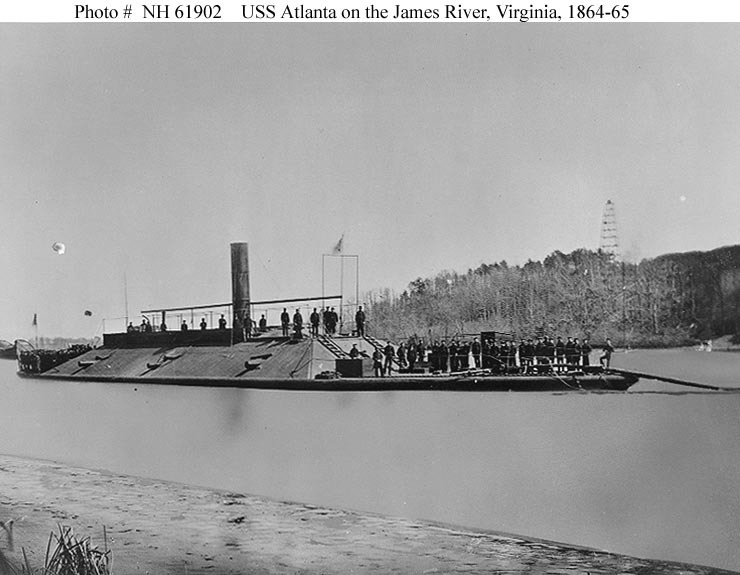 The Atlanta began life as a blockade runner named Fingal. Like many Confederate naval projects, she was a novel wartime adaptation of what was available. With the upper structure cut down, a frame was built and armored with railway iron. The weight of armor caused the ship to run deep, with a draft of 16 feet. Furthermore the she maneuvered sluggishly. Both issues that factored in the ironclad’s later fate. On June 17, 1863, commanded by Lieutenant William A. Webb, the Atlanta maneuvered into Wassaw Sound to attempt a breakout to the open sea. Webb was confronted by the monitors USS Weehawken and USS Nahant under Captain John Rodgers. Early on, the Atlanta ran aground on a shoal and became an easy target for the Federal gunners. Faced with an impossible situation, Webb surrendered. The Atlanta was later repaired and placed into Federal navy service. She served with the James River squadron blockading Richmond. Presumably, the armament of the ironclad was dismounted after the war as trophies when the ship was scrapped. Some accounts have the ship sold to Haiti, without the Brookes obviously, but floundering in transit off Cape Hatteras. The Brookes are worth a more detailed discussion. All four were “early” Brooke guns and share some visual similarities with the Parrott rifles. While later Brookes had multiple reinforcing bands, these have a single band, much like the Parrotts. The two main differences between Parrotts and Brookes require some close inspection. Parrotts have rectangular groove, right hand “gain” twist rifling, with the number of grooves increasing by caliber. Brookes have a triangular profile, constant rate, right hand twist rifling, with the number of grooves for either caliber set at seven. Furthermore, while the bands look similar, those of the Parrott were wrought iron, while those of the Brooke were but welded. The guns themselves carry interesting “trophy” inscriptions inscribed on the breech. While each is a little different they generally identify the capture date, the CSS Atlanta, and caliber. 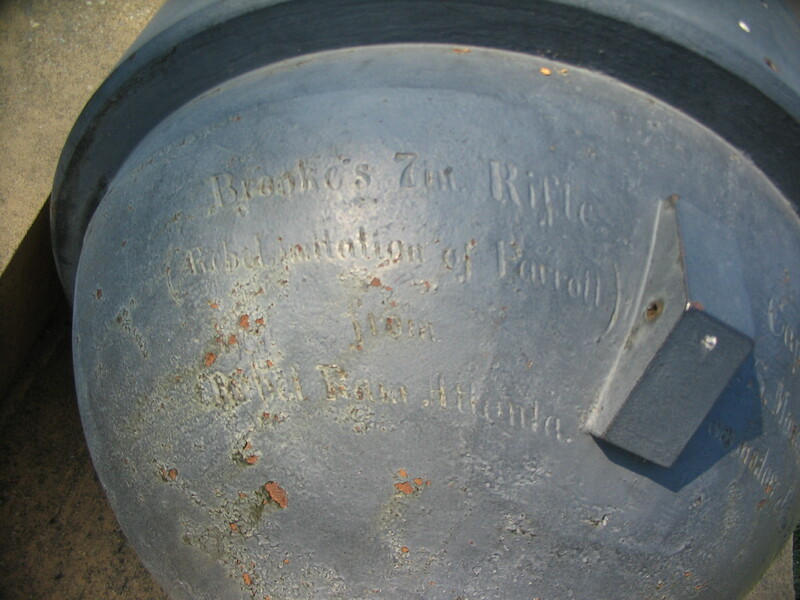 At least one inscription cites the Brooke as an “imitation” of the Parrott rifle. 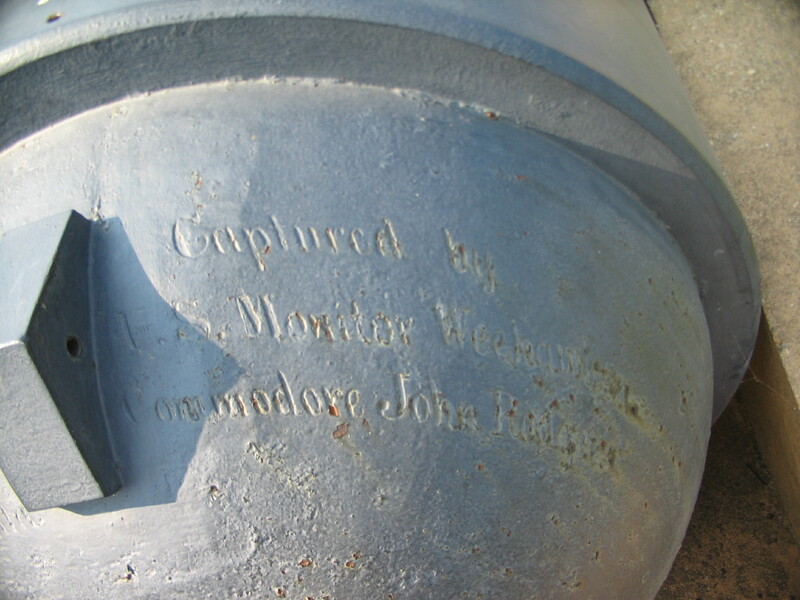 The inscription and founder’s marks link the guns to the ironclad. These are not the only Brookes in the Navy Yard. Several from the CSS Tennessee in particular are on display nearby. But those are later models with multiple reinforcing bands. In fact, only five single banded Brookes exist today. In addition to the four on display at Willard Park, a fifth single banded Brooke is in the trophy collection at West Point. It too has an Atlanta connection. At West Point a 7 inch Brooke is listed as trophy No. 180, captured at Charleston, S.C. at the end of the war. Previous to it’s employment on land defenses, that particular weapon had been issued to the Atlanta, but rejected due to defects. La Nota es Instructiva, gracias por permitir el uso de esta.